Last week, there was a rainstorm that cancelled my normal Wednesday swim practice. So I decided instead to do my grocery shopping (no logic behind that), and on my way check out the new bike shop in town, Cycle Sport Concepts. I knew my bike needed a tune up, so I wanted to stop in and see how long it would take to get it back. 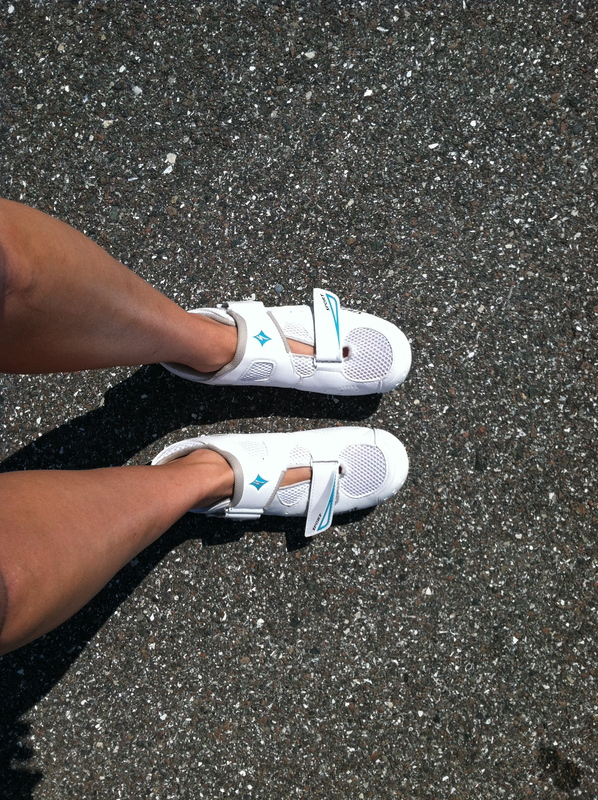 I immediately went home and put my old cleats on the new shoes so that I could ride on the trainer. Unfortunately, my trainer was stripping my back tire, so I said forget about it! 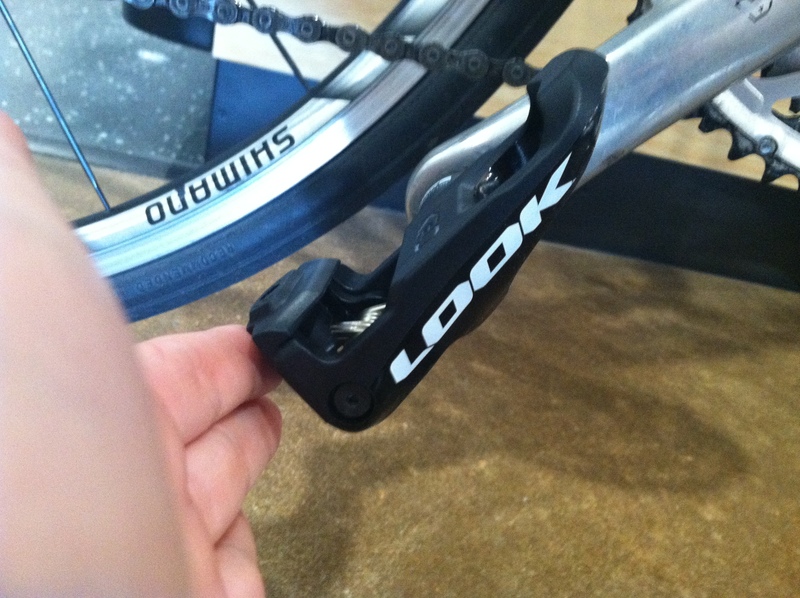 On Thursday, I took my bike in for the tune up, and chatted with the guys about bike pedals. My pedals were pretty rusty, so I knew I wanted to replace them too. At a suggestion from Felipe, I decided to go with the Keo Look pedals (<– mine were cheaper at the store), and asked the guys to put them on the bike. 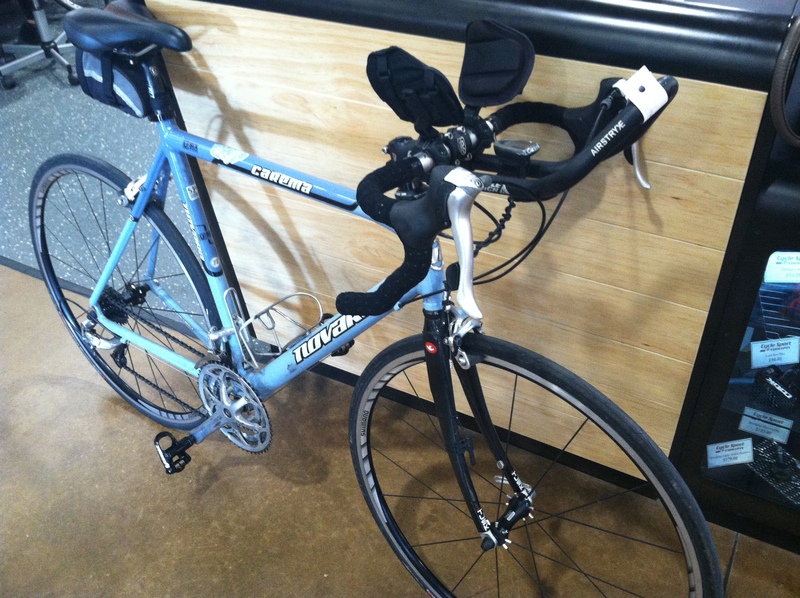 Friday after work, I showed up at the shop, and my bike was all tuned up, ready to go, new pedals and all! 24 hour turn around and great customer service? Heck yes! I’ll definitely be back! I was super pleased with the service that I got at Cycle Sport Concepts. Everyone was really friendly, and they did a great job on my bike. I know the store is still really new, so there weren’t a ton of customers in there and they could (and did) actually take the time to talk to me. I hope it stays like this, even after they get busy (which I hope they do!). I couldn’t wait to get in a ride, but I had plans on Friday night, so I told myself I’d get a long ride in on Saturday. I was going to trek into St. Pete to do the St. Pete Mad Dogs (tri club) ride on Saturday morning, but I opted to sleep in a little and go solo when I woke up. I rolled out of bed and made myself some zucchini bread oatmeal (without the oats). I followed Tina’s recipe, but I added in about half of a zucchini, finely grated, and a big dash of cinnamon. Topped with maple syrup, this was great fuel for my ride. 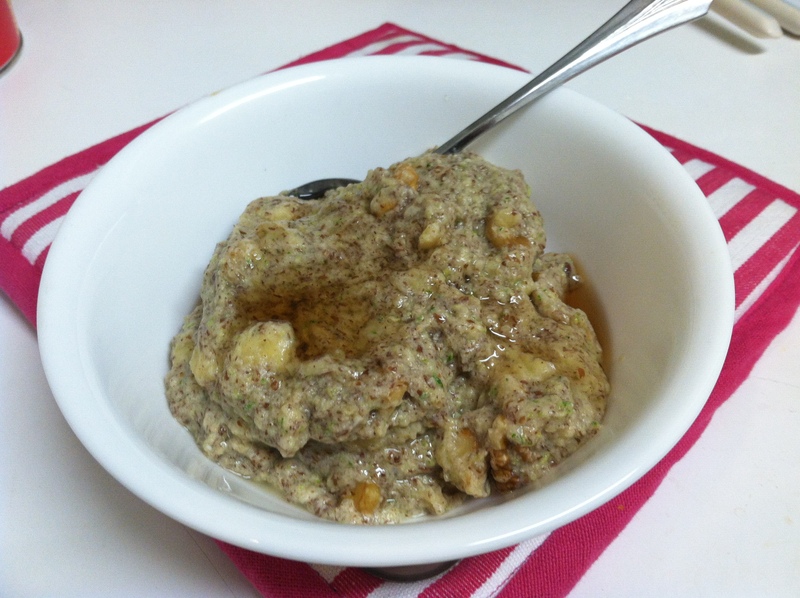 However, I still love real oatmeal; the texture of the no oat oatmeal is a little mushy- it needs the oats for chewiness! 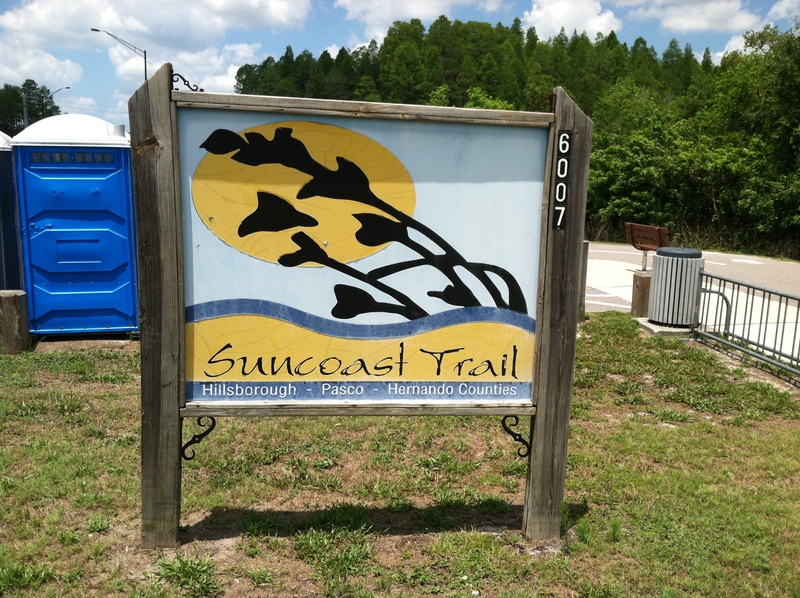 After breakfast, I drove up to the very northern part of Hillsborough County to the southernmost trail head of the Suncoast Trail. 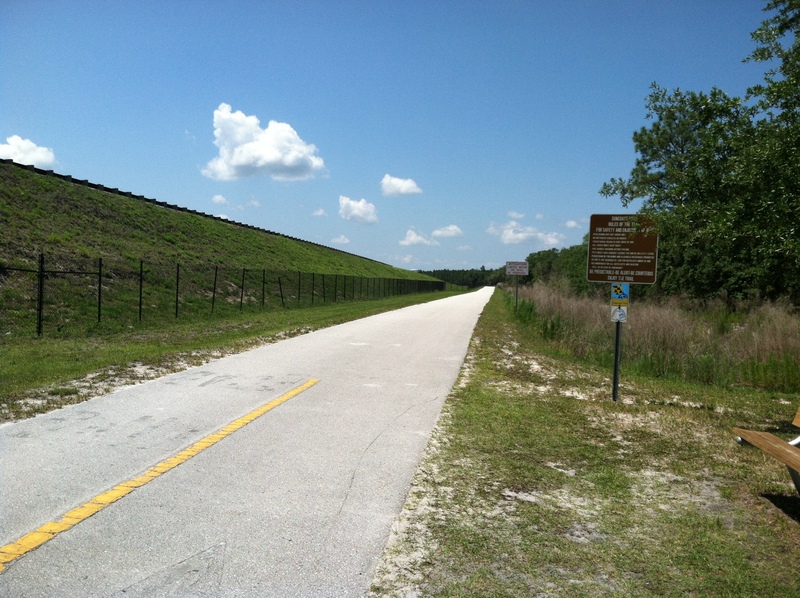 (Highway is on the left) There are a few places to stop and sit along the way, and a few water stops. But, they warn you that there won’t be places for water and that you need to be prepared! I came prepared with water and Acellerade, but did stop to refill at my halfway point. 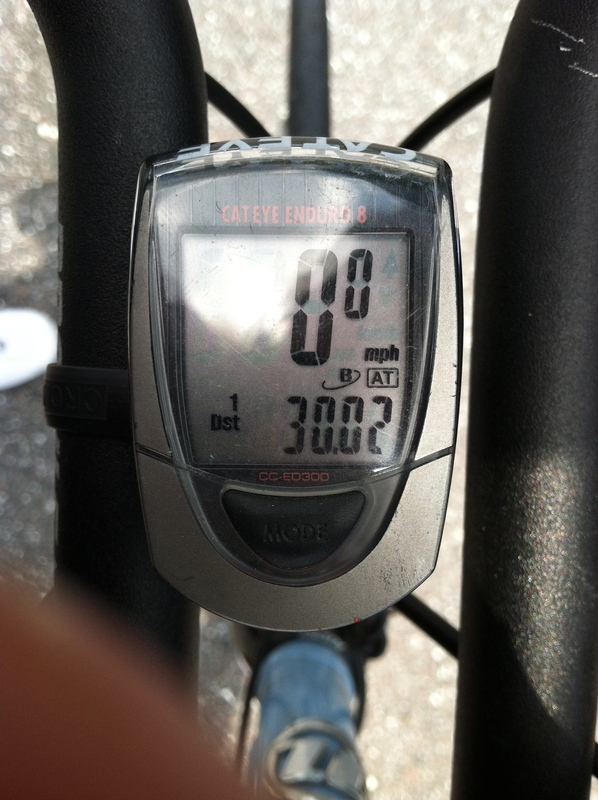 I had a good ride, and on the way back I was able to get in some pretty good speed. However, those long, flat rides are kinda boring. And it was hot. I do have myself to blame a little for that since I started late in the morning, but I guess I’ll need to get used to training in the heat anyhow. I’m glad I went up there, and it will probably be where I do a lot of my rides, but it really made me miss biking in DC. I feel like there were so many options for rides in DC. There were a bunch of trails, or you could drive out a bit further and hit some rural areas. DC has a lot of shaded paths too. Oh, and in DC, I could bike to a number of good trail heads. Here, I feel like there’s one place I can bike- Davis Island. There, I have to ride loops (kinda like Haines Point rides in DC). To get to any other trails, like this one, I have to drive at least 30 minutes. Boo. But, I’ll make these trails work for me for sure. And, I’ll head over to the Mad Dog ride in St. Pete/Clearwater, because that goes close to the beach. I’ll take a flat ride where I can breathe in salty air any day! those shoes are adorable, love them! Thanks!! I was totally sold on the looks of them!! Ugh .. riding loops like haines point. Hopefully you will be able to find some new riding areas. I hope so too! I think there are a few other options…but FLAT FLAT FLAT!!! WOW! That’s incredible!! I love when they care about their customers! !